I am currently building up a 5.0 system based on Klipsch speakers. After receiving the Klipsch rp-150m from Amazon and testing them a day long, I figured two things: I absolutely adore the claritiy of the heights the speaker delivers. Secondly, that I am sadly missing the third monitor I had on my fap cheaper Grundig bookshelves. It just feels like something is missing in the bass department with most music. I know that I could or should paire the speakers with a good sub, but but I have doupts that my neighbours would forgive me that. I don´t think I could get myself a subwoofer... the walls of my appartment are so extremly thin and hollow. Do you think it would be a good idea to upgrade to the Klipsch R-28F floorstander or another similar priced floorstander with the third driver, I a missing now? I would just exchange the rp-150m´s I currently have. I am living in Germany and I think about 300Euro is as much as I can spend with a good concience for one speaker( I´m a student). My only doubt about going that way is that I heard in a review that Klipsch made some changes to the horns and the ones rp-150m´s are different than with the older modells. Is that true? Because I really enjoy the sound I have right now. (Except of the feeling that I am missing the base of the music.) I don´t want to sacrifice the nice heights these bookshelfes produce right now. 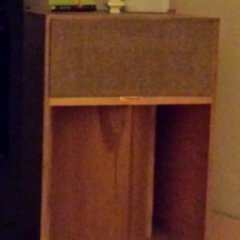 Sadly I don´t find many used klipsch products in my area, so I can´t just buy a used and odler, formerly expensive klipsch floorstander. Also I generally listen to all kind of music, but mostly at low or moderate sound(because of neighbours). I really appreaciate any suggestions! If you need to know a few more things, just tell me. Floor standers or a sub can both bother neighbors if up loud enough and the driver is capable of producing very low frequencies. A small sub that does not have a frequency response out of the upper 30's to low 40 Hz range would go well with those speakers. An 8 in. and no larger than a 10 in. sub should fill the low end for apartment style living or close neighbors. Welcome to the forum David. Thank you for the qualified answer! Do you think the rp-150m plus the R-10 SW Subwoofer could hold against the Rp-260f in terms of music? I find it hard to iimaginary add the sound of a (good) sub. As I found out, the rp-series is generelly build equally, so could I expect the same music quality plus a broader bass and middle response from the Rp-260 f? Is anybody of you actually using a sub together with the floorstanders for music? I have the RP160M and recently sold my R-28F. You have the better choice, the RP150Ms are better quality builds than the R28F imo. You're right to think the floorstanders would play lower, they would. A small sub as suggested would work great, and allow you to choose where to place it based upon where it sounds best. That is a big benefit of a separate sub. You could select which one by how it performs and what your needs are, which are modest. You could also switch to floorstanding models, since you don't want a lot of bass but want more. Bass from a separate sub can be positioned in a different place than the mains, which is that benefit of the sub. The floorstanders however incorporate into one larger box, and do sound really good too. Either will work. Don't fear subs, they are not by nature loud or anything but smooth and great. How some people deploy them is why you may be hesitant to get one. They don't always understand how to set them up. Want more low end extension but don't want to bother the neighbors? Easy to do -- either way. If you like your RP150Ms why change them? Get a small sub (used, if $$ are critical) and surprise yourself with what you can add. The folks here will certainly help you integrate it.